As most of you might know qualitative photos are almost the most essential part of having a great and successful blog. I have been using my camera Olympus E-400 for almost 6 years. Which is a long time for a camera. It has served me very well, but the technology has evolved so much since then and I feel that I have outgrown my camera. I need a new challenge. Both of them are really great and have amazing features. For example, you can shoot HD videos with them. For which I am very excited about! Nikon is a bit better (longer battery life, has 2x faster shutter speed, has better image quality etc,). Though, Canon has some advantages over Nikon as well (better light sensitivity, has in camera HDR, higher true resolution etc.) and the main advantage would be that it’s cheaper! Ah, what should I do? Do you own any of these cameras? Can you advise me something? Which one you would prefer? I don't own those specific cameras, but if i would have to choose, i would definitely buy Nikon. I own one camera from Nikon and i love it. Although i'm pretty sure that Nikon lenses are more expensive than canon lenses, but though i would choose the nikon. I'd say Canon. all my cameras have been from Canon and I'm so happy with them! I am a Nikon girl but both are great! Both are great!Would you like to follow each other? when i was about to buy my cam, i couldn't decide between nikon & canon as well. but most of the photographers i'm friends with told me to take the canon. so i bought the 550D! you'll gonna be satisfied with the 650D for sure! It´s the huge Nikon or Canon questions xD Well I have a Nikon and I also heard that Nikon has a better technology at the moment but among the great fashion bloggers I saw more Canons than Nikons. Such a big and fun decision, all my friends who are photographers and in the film industry always suggest Canon, and I'm a Canon girl myself, I just love the quality and everything about Canons. I'm sure you'll love either one 🙂 Good luck! I have a Canon and I love it if that's any help =) they're very nice to handle and provide great images. I can't help you, I'm not able to choose! sorry!! I don't really know much about cameras, but based on the information you have given me, I would choose the nikon. But I don't think you would go wrong with either one. I have the canon eos rebel and I absolutely love it! It is very easy to use, and the pictures come out so clear, I would highly reccomend a canon! But nikons are very good too, tough decision! Unfortunately I cant help you because I dont have any of those. But I have Canon 5D III. and its awesome! I wish I could help but I don't know much about camera, both have excellent reviews and I am sure any of them will take great pictures. I think both are great! But I'm a Canon user! I think I would go for the Nikon. I have a Nikon D90 with the 18-105mm lens and it works great! Don't have experience with Canons though. 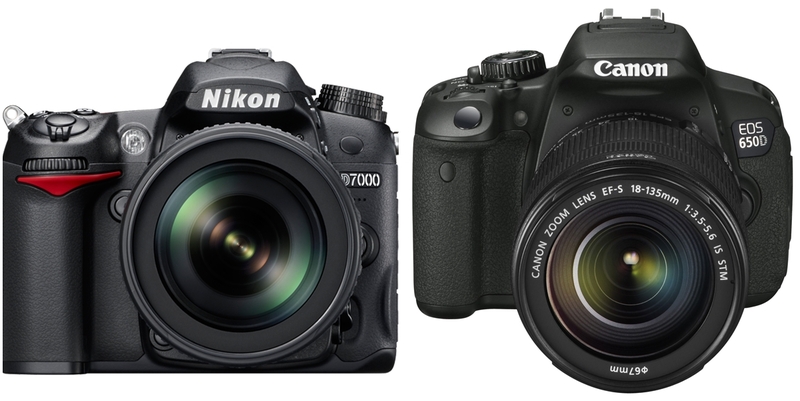 Briefly looking at reviews online though, the Nikon D7000 beats out the Canon EOS 650D. If the price is a little too much though, you might want to consider the Nikon D90 too. It's one below the D7000. The price has gone down significantly and it's an amazing camera! You can check out some reviews between the Nikons as well and see if it would make a difference to you. It depends on your budget. It also depends what you will be using it for. Little details might not make a huge difference for what you want to use it for. Have fun shopping! I think them are both great! I actually do have the Nikon D7000. Originally I was pretty excited by its video functionality, but I ended up being disappointed with it. It works fine in just one setting without zoom, but it's really slow and noisy to automatically refocus the shot when you zoom into something. The pictures it takes are fantastic quality though, especially in low light conditions. Recently I started my own blog, after a long time of getting persuaded by many friends! 🙂 Hope you like it! My sister owns a Nikon and the photos always come out amazingly, but I've heard great things about the Canon 650D too, I think you'll be happy with whichever you choose because they're both great camera's and get the job done! Hello hun, thanks for visit my blog!! Omg!! i love those cameras. both is great!! Interestingly enough, you're not the first person who I know of deciding between these cameras. The other blogger went with the Canon.